This Captive-Bred Gold Stripe Maroon Clownfish from ORA® is a perfect addition to your reef aquarium. 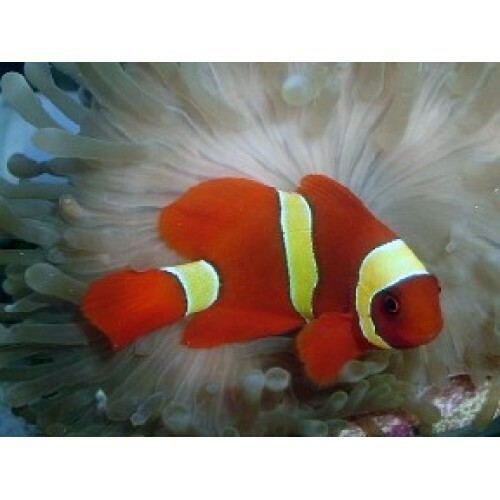 Normally, Maroon Clownfish vary in color from bright red to dark maroon, with three narrow white stripes. The ORA broodstock was found in the area of Sumatra. The gold color of the stripes typically does not develop until the fish are about 9-12 months old. ORA fish are shipped at about 6-7 months, so they are showing the juvenile white stripes. They will develop the gold color in time, starting with the head stripe. These very popular fish are easy to keep in aquariums, although they do not get along with each other. Unless a hobbyist can get a mated pair, it is best to keep them one to a tank. It has been observed that the gold stripe variety seems a little less aggressive than the White Striped variety. This is one of the largest clownfish species; adult females can attain a size of over 6 inches.This is a very long-lived fish; ORA has had pairs that spawned for more than 35 years.